Astronomers using ESO’s Very Large Telescope have discovered a gas cloud with several times the mass of the Earth accelerating fast towards the black hole at the centre of the Milky Way. This is the first time ever that the approach of such a doomed cloud to a supermassive black hole has been observed. The results will be published in the 5 January 2012 issue of the journal Nature. During a 20-year programme using ESO telescopes to monitor the movement of stars around the supermassive black hole at the centre of our galaxy (eso0846) , a team of astronomers led by Reinhard Genzel at the Max-Planck Institute for Extraterrestrial Physics (MPE) in Garching, Germany, has discovered a unique new object fast approaching the black hole. Over the last seven years, the speed of this object has nearly doubled, reaching more than 8 million km/h. It is on a very elongated orbit  and in mid-2013 it will pass at a distance of only about 40 billion kilometres from the event horizon of the black hole, a distance of about 36 light-hours . This is an extremely close encounter with a supermassive black hole in astronomical terms. The cloud’s edges are already starting to shred and disrupt and it is expected to break up completely over the next few years . The astronomers can already see clear signs of increasing disruption of the cloud over the period between 2008 and 2011. The material is also expected to get much hotter as it nears the black hole in 2013 and it will probably start to give off X-rays. There is currently little material close to the black hole so the newly-arrived meal will be the dominant fuel for the black hole over the next few years. “The next two years will be very interesting and should provide us with extremely valuable information on the behaviour of matter around such remarkable massive objects,” concludes Reinhard Genzel. 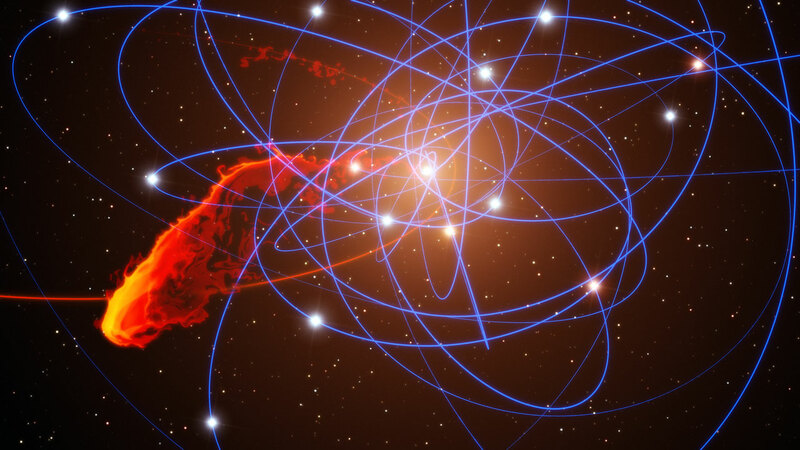 The black hole at the centre of the Milky Way is formally known as Sgr A* (pronounced Sagittarius A star). 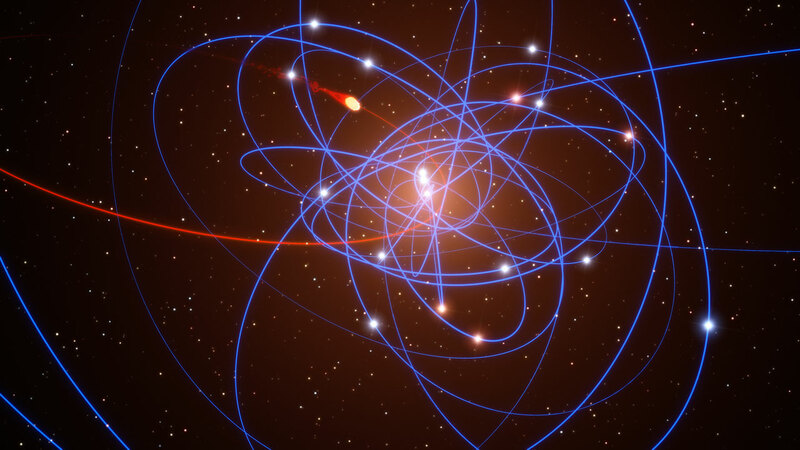 It is the closest supermassive black hole known by far and hence is the best place to study black holes in detail. The observations were made using the NACO infrared adaptive optics camera and the SINFONI infrared spectrograph, both attached to the ESO Very Large Telescope in Chile. The centre of the Milky Way lies behind thick dust clouds that scatter and absorb visible light and must be observed at infrared wavelengths where the clouds are more transparent. This effect well known from the physics of fluids and can be seen when for example pouring syrup in a glass of water. The flow of syrup downwards through the water will be disrupted and the droplet will break apart — effectively diluting the syrup in the water. This research was presented in a paper “A gas cloud on its way towards the super-massive black hole in the Galactic Centre”, by S. Gillessen et al., to appear in the 5 January 2012 issue of the journal Nature. The team is composed of S. Gillessen (Max-Planck-Institut für extraterrestrische Physik [MPE], Germany), R. Genzel (MPE; Department of Physics, University of California [UC], USA), T. Fritz (MPE, Germany), E. Quataert (Department of Astronomy, UC, USA), C. Alig (Universitätssternwarte der Ludwig-Maximilians-Universität [LMU], Germany), A. Burkert (MPE; LMU), J. Cuadra (Departamento de Astronomía y Astrofísica, Pontificia Universidad Católica de Chile, Chile), F. Eisenhauer (MPE), O. Pfuhl (MPE), K. Dodds-Eden (MPE), C. Gammie (Center for Theoretical Astrophysics, University of Illinois, USA), T. Ott (MPE).